Our “pursuit of uniformity” aims to control product variation and provide high-quality products that satisfy customers. It is the concept that forms the basis of our company’s quality control. This concept, inherited from our past and unchanged up to the present, enables us to achieve consistent quality at the global level. On July 22, 1912, Nippon Toki’s Magoemon Ezoe and Kichijiro Yamada departed for Europe from Tsuruga Port in Fukui Prefecture. Their departure was kept a secret from others in the industry. Their purpose was to acquire skills through practical training at the Victorian porcelain factory in Austria. The two of them also visited the Zegel Laboratory in Berlin to ask to have the potter’s clay used in Japan tested. To help them find solutions to problems related to the productization of dinner sets with 24-cm plates, Dr. Cramer, who worked for the laboratory, gave them three pieces of advice: the raw materials should be more pure, the grain size should be finer, and the clay should be aged. While the research performed thus far by Nippon Toki tended to concentrate on the physical strength of the clay, Dr. Cramer emphasized the uniformity of the base material, prompting a new way of thinking at Nippon Toki. This is the origin of our “pursuit of uniformity,” something valued by our employees to this day. The breakage problem of special high-voltage pin insulators repeatedly occurred in 1914. After various tests and research were carried out to determine the cause, it was discovered that differential expansion between the insulator ceramics and cement was the cause, and there was hope for a solution. However, numerous breakage incidents occurred the following year regardless of whether the products were domestically produced or imported, and the Japan Electric Association, which regarded the matter seriously, launched an investigation into the cause. In July 1915, while this was going on, Kazuchika Okura and chief engineer Saburo Momoki went on an investigative trip to Europe and the United States. 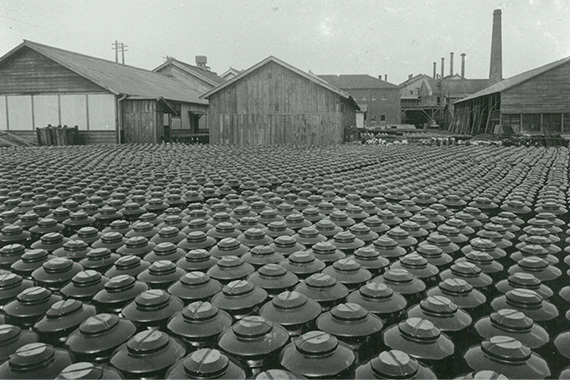 They toured an insulator plant belonging to the Ohio Brass Company in the United States and were shocked to see the technological disparity in manufacturing compared to Nippon Toki. 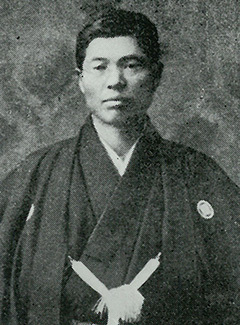 In correspondence sent to Japan, Okura wrote, “The way we’ve been thinking about insulators — that using the worst-quality clay is okay, that merely passing electrical tests is okay, and that making things cheaply to earn a profit is satisfactory — needs to be reformed.” He reflected deeply on Nippon Toki’s failure to use high-quality ceramics clay as the raw material for insulators as well as its inadequate concern over quality, and strongly advocated for the need to make comprehensive changes to its manufacturing policies. In the light of this realization, Momoki demanded that the company strive to improve quality when manufacturing insulators, and he proposed the concept of ‘uniformity’ with regard to the mechanical strength of products. 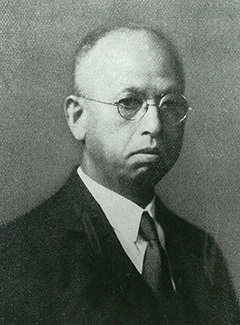 Momoki joined Nippon Toki in 1904 and was put in charge of insulator development. Originally, the concept of pursuing uniformity did not permeate all aspects of management. The turning point was when the Insulator Department was spun off from Nippon Toki, resulting in the establishment of our company. Orders flooded in amidst the economic boom that took place after the end of the First World War, and the company couldn’t afford to think about quality control. However, the situation changed with the post-war depression. As prices declined due to intensified competition, improving competitiveness through lower costs and higher quality became necessary. Given that situation, we carried out tests to compare our products with those produced by competitors in Japan and overseas with the cooperation of technicians from Great Consolidated Electric Power Company, and we discovered that the uniformity of our products was greatly inferior to products made by Ohio Brass Company with its superior capabilities. Since then, ensuring product uniformity has been a part of our management policy, and we have made systematic improvements throughout our manufacturing processes, including raw materials and base materials. After the Second World War, our company worked on expanding its insulator business and became the world’s leading insulator manufacturer in the 1960s, and it goes without saying that one of the motive forces was the consistent quality achieved through the pursuit of uniformity. 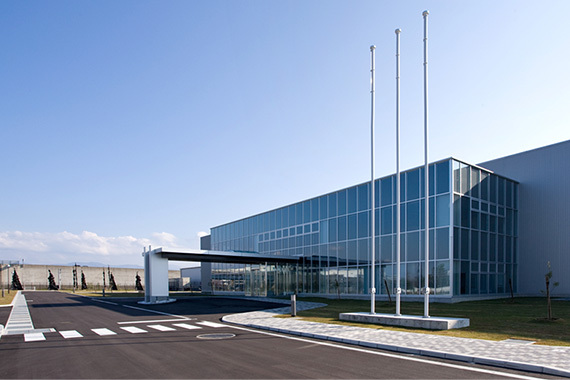 Since the 2000s, our company has made progress on "structural innovation in manufacturing" by further improving product competitiveness through lower costs and shorter lead times as an initiative clearly distinguished from annual improvements made in the past in order to achieve sustainable growth, and these activities continue to this day. In our Automotive Ceramics Business in particular, we have tried to introduce the latest technologies that go beyond conventional thinking in order to achieve globally uniform quality, and this has meant nothing less than pursuing uniformity at the global level. Over the past 100 years, our pursuit of uniformity has deepened from raw materials to products and then to our management policies, and this concept remains with us today in our global expansion and our achievement of globally uniform quality in our Automotive-Ceramics Business.